The primary aims of this code of conduct are to ensure that the consumer receives the best possible service from ASATA members and to maintain the standing and good name of the Association and its members. – between themselves and partners. – Members shall conduct their business in a manner that maintains and enhances the standing of the Association and its Membership and is binding. – Members shall comply with all relevant statutory and regulatory requirements. ASATA Members will not falsely represent any individual or legal entity’s affiliation with their firm. ASATA Members shall maintain a high standard of service to Consumers. Members shall be honest and accurate when providing information in any form about their services and prices. ASATA Members shall make every effort to ensure that the travel arrangements sold to Consumers are compatible with the Consumer’s requirements. ASATA Members will always put the interests of the Consumer first and not allow any preferred partnership or relationship with a supplier to interfere with these interests. ASATA Members will respect the confidentiality of each Consumer’s transaction and will not disclose any information regarding the transaction to any other Consumer or any other member of the public, excluding ASATA, unless required by law. ASATA Members will cooperate with any inquiry conducted by ASATA to facilitate resolution of a dispute involving Consumers or other ASATA Members or Partners. 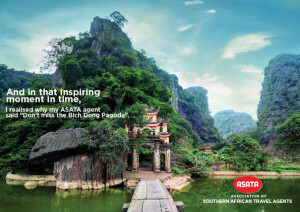 ASATA Members will provide all components as stated in their brochure or as stated in their written confirmation. Failing that, the ASATA Member will provide alternative services of equal or greater value or provide appropriate compensation. ASATA Members will ensure that all Consumer advertising contains fully inclusive prices in accordance with the ASATA Advertising Guidelines policy. ASATA Members will not discredit other Members in the public domain either by press editorial, advertising material or any other means. ASATA Members are bound to use the ASATA logo in their communication in accordance with the ASATA corporate identity guidelines. Members shall ensure that their Customers have access to all booking and other conditions applicable to their Travel Arrangements before a booking contract is signed or agreed to. Members are to provide, on request, access to any booking conditions that apply to the transaction. When conducting business as a Retail Travel Agent, ASATA Members shall ensure that they pass on to the Consumer all relevant confirmations and documentations from the Partners and / or suppliers intended for the Consumer. ASATA Members will make available details about terms and conditions of any travel service or product, including cancellation and service fee obligations, before accepting payment for the booking or before a booking contract is signed or before a booking is accepted. ASATA Wholesalers will promptly advise the Retail Travel Agent or Consumer who reserved the space of any change in itinerary, services, features or price. If substantial changes are made that are written within the control of the operator, the Consumer will be allowed to cancel without penalty unless otherwise stated in the terms and conditions of the operator. ASATA Members will promptly (within 7 (seven) working days of receipt of the documentation or request for refund) submit any refund documentation or requests to the Partner or supplier provided that the refund meets the timeframe as outlined in the terms and conditions of the Partner or supplier. ASATA Members will remit any undisputed funds under their control within 7 (seven) working days to the Consumer in respect of refunds. If a delay in providing the funds is experienced, reasons will be given to the claimant. Members are to inform Consumers that health, visa and passport documentation may be required for their journey, and that the acquiring of valid documentation is the responsibility of the Consumer. Members shall advise the Consumer of passport, visa, health and other entry and transit documents required for the journey where it is reasonably practicable for the Member to do so, OR the Member shall offer the Consumer reasonable assistance in accessing such information. Such information or assistance is to be provided in sufficient time for the Consumer to obtain such documentation, or at the time of booking. Members shall draw the Consumer’s attention to the availability of insurance cover for their travel requirements before the date of travel commencement. An acknowledgement shall be sent no later than 5 working days from the date of receipt of the dispute in writing to the Consumer from ASATA. A detailed response from the Member to ASATA shall be sent not later than 14 working days from the date of receipt of the dispute or the Member shall provide reasons for the delay. Members shall make every effort to resolve any dispute, including acting as an intermediary where the customer has a dispute with a Partner or supplier, and the travel arrangements were booked through the Member. Members shall advise Consumers of their right to refer the dispute to ASATA in the event of this not being resolved with the Member.